If you are sick of yo-yo dieting and overly restrictive diets that limit carbs, or if you're stuck in a diet plateau, Eating Free can give you back the food and the life you love—while still helping you to lose weight. To date, 2,000 men and women have transformed themselves on the Eating Free program—with an 84% success rate of weight loss maintenance. Other diets, on average, have an 85% failure rate. Eating Free reveals why a little-known hormone, ghrelin, is wreaking havoc on your waistline; why almost everything you think you know about weight loss is wrong; and why what most Americans do in earnest to lose weight actually creates the Perfect Storm for them to gain weight! Eating Free is a refreshing change from diets that leave many Americans depressed, exhausted, and malnourished while stalling their motivation and metabolism. 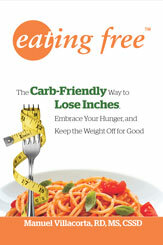 With Eating Free, you can lose the guilt, the misconceptions, and the weight—for good! Eating Free sets the record straight on these common myths, and many, many more. Myth 1: Exercise Is Critical for Success. Exercise is important for health, but not as critical for weight loss. You don't need to spend hours at the gym. Eating Free offers a realistic alternative to the gym-rat mantra by proving that weight loss is 80% nutrition and only 20% exercise. What's more, since exercise causes ghrelin levels to spike, hitting the gym may be more detrimental than hitting your snooze button. You'll learn how to shop, not sweat your way to being lean, and focus on preparing delicious food instead of exercising excessively. Myth #2: You Need to Cut Out Carbs. With Villacorta's formula for optimal weight loss—45% carbohydrate, 30% protein, and 25% fat—you will satiate your appetite by controlling the hunger hormone ghrelin and green-light a wide variety of delicious 'forbidden' foods (pasta, potato, rice, and chocolate) so you don't feel deprived. This formula prevents muscle breakdown and keeps you energized while losing weight. Myth #3: You Need to Track Your Weight Progress Daily. Instead of obsessing over what the scale reads each morning, you'll learn why it's more effective to gauge your body's needs in weekly increments. With a free online tool, The Free Q, you can score every lifestyle element that impacts your weight loss, including lots of stress and little sleep. This tool helps you live wisely for weight loss each week. No other program demonstrates how these elements play a critical role in weight loss with a free practical tool. Villacorta is a trusted voice in the health and wellness industry. A national media spokesperson for the Academy of Nutrition and Dietetics from 2010–2013, he is also a health blog contributor for The Huffington Post and an on-air contributor for Univision. His latest contribution was as leading nutrition expert for a series about Superfoods with National Geographic. Villacorta is the owner of MV Nutrition, a San Francisco-based private practice, and the recipient of five "Best Bay Area Nutritionist" awards from the San Francisco Chronicle, ABC7 News and Citysearch. Born and raised in Peru, he lives in San Francisco. He earned his Bachelor of Science in nutrition and physiology metabolism from the University of California, Berkeley, and his Master of Science in nutrition and food science from California State University, San Jose.